Samsung and HTC are the most two well-known Android handset manufacturers in the world. If you were a user of HTC in the past but now get a new Android smartphone – Samsung Galaxy S9/S9+, the first thing occurs in your mind may be “HTC to Samsung Transfer”. Have no idea about it? Never mind! Here in this guide I will show you two efficient methods to transfer data from HTC to Samsung Galaxy S9/S9+/S8/S8+ effortlessly. Part 1. How to Transfer Data from HTC to Samsung Using Smart Switch Mobile? Smart Switch mobile is a free phone to phone data transfer app designed by Samsung. By using it, you can transfer all your personal information, multimedia files and apps from HTC to Samsung Galaxy S9/S9+/S8/S8+ without any cost. 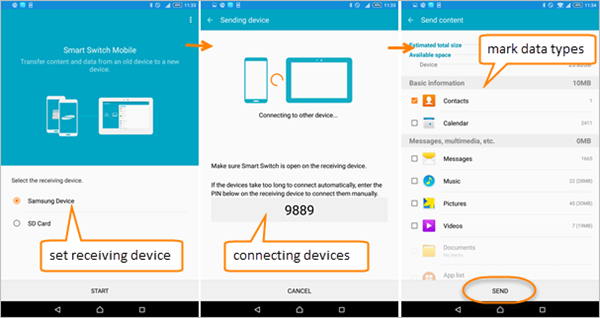 Download Smart Switch Mobile (app) from the Google Play store, then install and run the application on both devices. A. Set HTC as the sending device. B. Please tap CO ECT to connect the two devices wirelessly. C. After the devices have been connected successfully, all the file types will be listed, please check the data that you want to transfer from HTC to Samsung, then tap SEND. D. When it finishes transferring files from HTC to Samsung, you will get the status completed, please tap FINISH. A. Set Samsung as the receiving device. B. 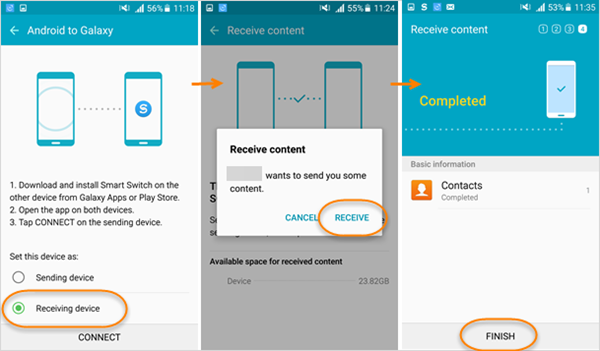 Please tap RECEIVE when you get a message goes “HTC wants to send you some content”. C. It will take a while to transfer all selected data from HTC to Samsung S9/S8. When it shows Completed, please tap FINISH to end the process of HTC to Samsung transfer. Part 2. How to Transfer Data from HTC to Samsung Using Gihosoft Mobile Transfer? If you don’t want to install anything on your smartphones, instead, you can directly transfer all data such as contacts, text messages, call log, photos, videos, music, calendar and apps from HTC to Samsung Galaxy devices with Gihosoft Phone Data Transfer on the computer. Click the above buttons to download and install the HTC to Samsung data transfer software, then run the program. Now tick all the data types to transfer data from HTC to Samsung Galaxy S9/S9+/S8/S8+. If you store a large number of photos, videos, music and other files on your HTC phone, then you will need some time to transfer those data from HTC to Samsung Galaxy S9/S9+/S8/S8+. During this process, please keep the device connected to your computer at all times. In addition, Gihosoft Mobile Transfer is a powerful phone data transfer software, it will not let you down if you want to transfer data from other Android to Samsung or transfer data from iPhone to Samsung.